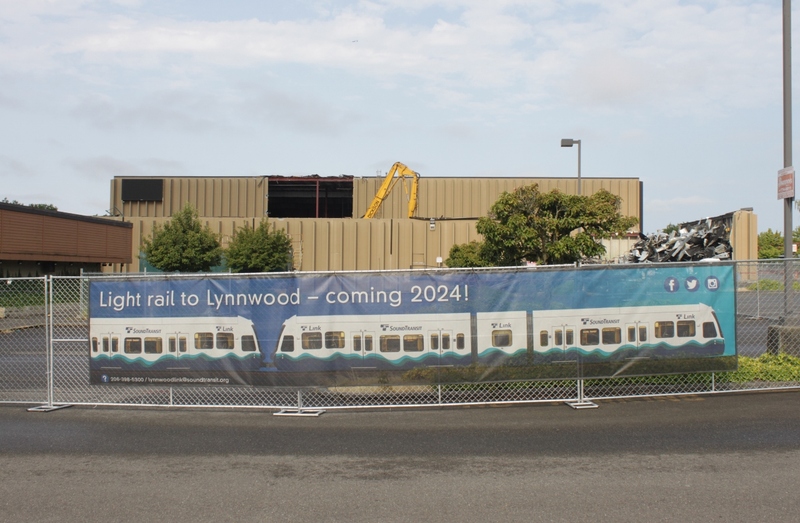 The baseline schedule for Lynnwood Link assumed that the FFGA would be signed in summer of this year, but the delay should not significantly impact ongoing planning work. A key milestone in the schedule, however, seems to have lapsed without much notice. The two-part civil contractor has yet to be selected by Sound Transit, but CEO Peter Rogoff said recently that the contracts should be approved during December. Construction is set to begin early next year and be completed in 2024, coinciding with a major restructure of bus routes in Snohomish County. Great news! Rumors of the demise of the FTA’s capital grants program have been greatly exaggerated. Minneapolis is getting their SW light rail line funded as well. Everything gets exaggerated these days. Good to see the funding. I still do find it amazing that it takes five – six years to build that section. While that may be correct, I don’t believe going along I-5 was the best option in the first place. But that’s just my two cents. At the current rate, with no schedule slides…., we’re looking at a fair bit less than 2 miles a year. They should have routed the line along SR-99. It would allow more access to places like Bitter Lake, Shoreline, and places in between Shoreline and Lynnwood. Also, I think SR-99 is a more densely populated corridor than i5. I’d be curious to find out what Rogoff’s participation was to get this money out. How much was our elected delegation in DC and how much was Rogoff’s prior FTA experience that provides insights on how to remove funding obstacles? One also had to also wonder why it was delayed. Was it because of some of these reasons? With Federal Way and Downtown Redmond due almost on the same timeline, there are still FTA negotiations to do. Hopefully the FFGAs for Northgate and East Link are still secure. I don’t think it was any particular local pressure: the entire program was caught in a showdown between the “transit is a local issue, let localities pay for it” Heritage Foundation position the administration took, and the pragmatic “this is the way things have been done since 1964” attitude of even pretty conservative appropriators in Congress. It’s hard to kill programs that dispense capital grants to hundreds of Congressional districts. “Any surface transportation project which receives Federal assistance under Title 23”. Title 23 refers to highway. There are some railroad crossings that probably got altered and hence Brightline and its investors got access to the bonds which now can be used for shopping centers and commuter rail. This is what Brightline argued! The republicans have been making changes lately so who knows, they can probably build hockey practice facilities with it now. They applied as a Title 23 project! It had nothing to do with shopping centers or rail! And no, I don’t like it. Just like I don’t like RTD allowing for private ownership of the Denver Airport commuter connection. I can ride a near 30 mile light rail line to the Portland airport for $2.50. For a shorter trip in Denver it cost me $9.00. I think a city attaining a federal grant like ST is doing is a much better way to implement rail transit. If ST wants to make it cheaper on tax payers they too can connect malls and hotels to their stations just like Denver’s RTD has done. To go 30 miles between Miami and Fort Lauderdale is $15.00 on Brightline. Again, Hillsboro to Portland airport is 29.5 miles and only $2.50 on Max. Lets give politicians exclusive access to our precious transportation corridors so they can gouge us. Oh, and lets give them the money in the first place so the pillaging can begin. Similar trips on WMATA in DC and MARC in Maryland are $7. There’s nothing wrong with charging higher fares for folks who are traveling further or using a more expensive service. Otherwise, users who take metro or metrobus for just a few stations in the urban core would be subsidizing suburban commuters who are traveling 30 miles or more. It’s the power of rural and exurban areas at the national level. They started off with structural advantages in the Senate and Electoral College, and were reinforced through gerrymandering and the 20th century suburbanization/freeway/big-box policies, and in the 2016 election they got both houses of congress and the presidency. Rural and exurban areas don’t see the value of transit, so they view highways and cheap gas as national necessities and transit as city luxuries. My take is that something about the midterm election results has forced the FTA and FRA to get moving. FFGA funding for Seattle and Minneapolis; the FRA European transit rules: these processes are required by law, yet the Feds have been delaying them for no official purpose. They might not get away with that so quietly after the new House is seated in January. Make no mistake, this money is coming for two reasons, and two reasons only: ST did the work correctly to get through all the process hurdles (NEPA, New Starts, etc.) going back over seven years; and Sen. Murray is one of the most senior members of the appropriations committee. If we are going to play the shoulda-coulda game, we will be here all night (and SR 99 versus I-5 will only come in the third hour). Hell, if we’re going to play that game, we could talk about subway proposals in the 1920s and what Philadelphia style subway / surface lines would have looked like today had they started then. There will eventually be an Aurora Corridor line if the region continues to grow. There’s no reason to think it won’t, and it continues to attract “urban” residents/voters, so it’s likely the big box/auto sprawl along Aurora north of 85th will be legislatively or economically forced to build above the current structures and use their parking lots for commerce in the daytime and residences at night. Yes, it’s close to the Red/Blue line “main”, but not close enough. Anyway, there aren’t enough stations on North Link to serve a large Aurora corridor efficiently. Whether the line is an extension of the Green Line — though probably as an operational overlay between the north terminus and somewhere in SoDo — or Seattle Subway’s Pink Line suitably modified south of 90th to serve Greenwood, Upper Fremont, Lower Fremont and Dexter remains for future generations to decide. That sort of optimism has played a part in the cavalier and misguided approach towards transit in this area. Mistake after mistake has been made, and when more mistakes are made, people just shrug, and figure the problems will be fixed in the future (instead of trying to fix the planning process). Except they won’t. Rail transit is, for the most part, a measure twice, cut once activity. If you make a mistake, then you are stuck with it. It wouldn’t be horribly expensive to move the Mount Baker Station a block or two to the east, but that isn’t going to happen. Nor will we build a station on First Hill, or where Link intersects 520. Nor will there be a station at Campus Parkway, or 55th NE. Nor will we build a SR 99 mass transit line. Doing so would be extremely expensive, and even if it wasn’t, would be unprecedented. Building the Seattle Subway map would make Link bigger than the Mexico City Metro, and likely as big as the New York City Subway. That means it would be the biggest or second biggest mass transit system in North America. Even if this was cheap surface rail (the way that many cities run light rail) it would be way too expensive. Cities, especially cities our size, just don’t do that. No one has done that (I can’t think of anyone that has come close). Yes, we will continue to grow, but we won’t catch big cities, like greater San Fransisco, Chicago, Washington D. C., or L. A. (where such a system might someday exist, although I wouldn’t bet on it). Despite the growth, we just aren’t that big, nor will we continue to grow at the extremely high pace of the last few years. Speaking of San Fransisco, they remain bigger than us. The city proper has 880,000, to our 725,000 (while the greater metro area remains about twice as big). Since the turn of the century, we’ve added about 160,000 people, while San Fransisco has added about 110,000. Since San Fransisco is physically smaller, they have grown more per area. Yet despite all that (and similar growth in surrounding areas, like Oakland, Berkeley and South San Fransisco, which really shouldn’t be thought of as suburbs, but contiguous urban areas that happen to be different municipalities) there hasn’t been a major “fix” to the system. BART is still BART (with no new lines or stations in the city) and the Muni is still slow. ST is a regional transit body. Once rail is laid from Tacoma to Everett ST’s mission will have been accomplished. At that point I expect ST to switch to an operations and maintenance mode, with any local projects in each city driven and financed by that particular city. Of course the problem with that is that Seattle won’t be able to afford to build the lines on its own that would benefit the city the most, so the whole building process will probably come to a halt. What’s wrong with that? You’re assuming the current sizes in other cities are the optimal sizes, but they are also the result of arbitrary decisions and politicking by people who were often thinking of something else. New York stopped building subways in the 1940s. Was it because they had the optimal amount? That’s hard to believe when parts of Brooklyn have no subway, the L line is full, etc. Instead it was emphasis on highway and bridge building, and later the state not giving the city funding to match its population and economic contribution to the state. Other systems grow or don’t grow simply because people vote one way or another, and sometimes vote one way one year and the opposite way another year. The paradigm that motivated all the cooperation between cities/counties/state and support for large capital taxes will end with ST3. Neither ST nor the cities have yet articulated a post-Spine paradigm that could plausably motivate people. O&M will continue by default because they’re built into the ST1/2/3 budgets. Pierce and Snohomish will argue that the Spine isn’t finished until it reaches Everett CC and Tacoma Mall, but those are small extensions that could be dealt with in a finishing-up measure. That could fit Ballard-UW or part of it. It’s not clear what South King would want, and a Kirkland extension (on the Issaquah line) might run into the same controversies that it did this round. ST’s expected push is to “complete the long-range plan”, but motivation for that may fragment and drop off. South King may have cooled about Burien-Renton, and in the absence of something else benefiting them, Renton and Kent may not be enthused for another round. I have suggested light rail between Rainier Valley, Renton, and Kent, but officials there have not mentioned it. And Tacoma may not be enthused about express buses in Puyallup and Orting if there’s nothing for Tacoma. Pierce and South King voted no in the last transit measures, with South King saying it’s too poor to afford more transit taxes, and Pierce complaining about little service in the sprawling southeast and ideological opposition to MVET. I fear Pierce might be disappointed with ST3, because the Tacoma Dome extension will just make regional trips slightly less bad rather than great, and Tacoma Link won’t help Tacoma’s mobility problems much either. Sounder’s improvements are still unknown until ST’s negotiation with BNSF conclude: we may get several more south trips or we may not, and ST hasn’t said what its plan B might be. East King seems to be mostly hard-to-serve population and trip patterns, so it’s unclear what could be great there. It may be disappointed in the Issaquah line (“I don’t really go much to Issaquah anyway, and there’s nothing in Viewmont.”) It could be a sleeper success between Bellevue College and Bellevue, but I’m less optimistic beyond that. And 405 BRT may be of mediocre benefit. 522 BRT will be a big success, but it’s hard to see the motivation for replacing a just-built and successful BRT line wtih a light rail line in that lowish-density area. North King will of course want more, so the limitation there is how much the other subareas want. Of course, the state could allow ST to split the tax district so that different subareas could go at different levels and times, or give flexibility to cities and counties to raise their own taxes for transit capital projects. But that depends on legislators changing their minds, and no MVET-killing initiative torpedoing things. So I don’t see that as a realistic possibility at this point. Happy for Snohomish County that this is moving forward. Great news! I believe this time frame was changed from 60 days to 30 days with 2012’s MAP-21 act, a significant piece of legislation for transportation program reforms passed in the 112th Congress. Be careful of reviewing the guidances (circulars) related to the FTA’s CIG programs on their website as some of these refer to the old time frame governed under 1998’s TEA-21 act. The bottom line is that Congress must be given at least 30 days notice of the Secretary’s intention to issue and sign the FFGA.